Quince aoli is the perfect accompaniment to crispy squid, served hot from the pan with a pinch of paprika and a few peppery rocket leaves. 3 medium squid, cleaned and cut into 1cm rings. To make the aoli, blitz the mayonnaise, quince, syrup, garlic and a pinch of salt in a food processor until smooth, then transfer to a serving bowl. 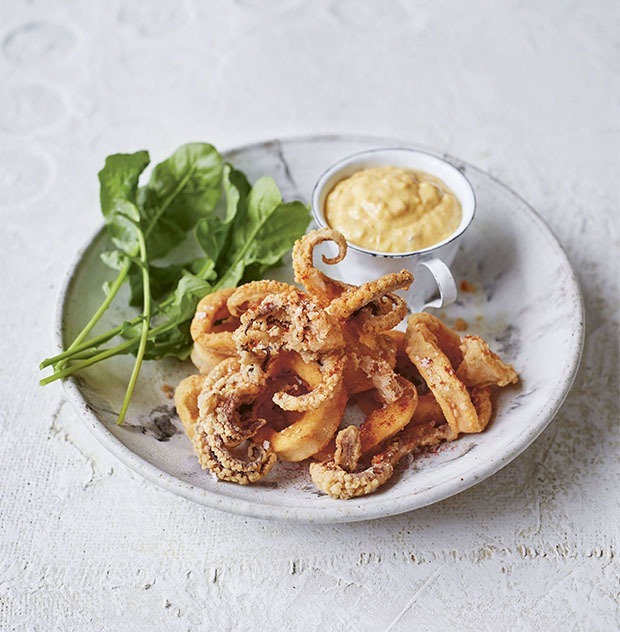 For the crispy squid, mix the flour, cornflour, paprika, cayenne and some seasoning together in a bowl, add the squid and toss lightly with your hands to coat the squid all over. Heat the oil to roughly 180C. You need to cook the squid in batches; fry for a minute or so until crisp and golden then drain on kitchen paper. Serve with a sprinkle of salt, paprika, rocket leaves and lemon wedges. Recipe is extracted from The Orchard Cook by Stuart Ovenden, Published by Clearview Books. Buy the book here.